The Boston Red Sox will face the rival New York Yankees in the American League Division Series after New York defeated the Oakland Athletics in Wednesday's wild-card game. 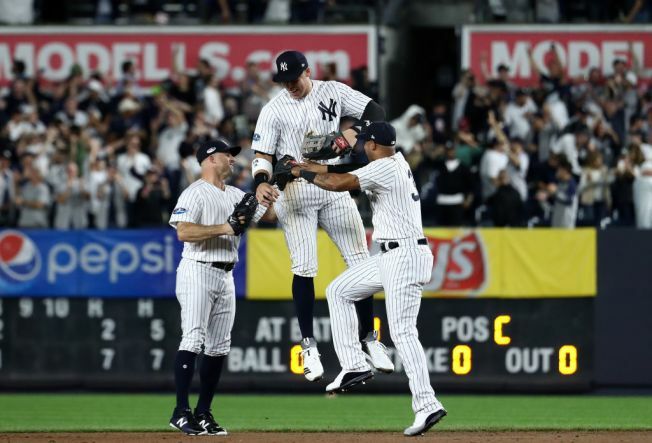 Aaron Judge got the party started with a two-run homer in the first inning, Luis Severino atoned for flopping in his postseason debut last year and the Yankees beat the A's 7-2. Judge's drive off starter-turned reliever Liam Hendriks got New York going, and the Yankees cruised into the AL Division Series. They'll face the Red Sox in the postseason for the first time since the 2004 AL Championship Series. Game 1 is Friday at Fenway Park. Late-season spark Luke Voit added a two-run triple in the sixth off closer Blake Treinen, setting off one of the boisterous Bronx celebrations that used to be an October staple. Giancarlo Stanton added a towering drive that just stayed fair in the eighth off Treinen in his postseason debut. For Oakland, it was just the latest letdown in a decades-long stretch of disappointment. The A's have lost eight straight winner-take-all postseason games since beating Willie Mays and the New York Mets in Game 7 of the 1973 World Series, and dropped all four of their postseason matchups against the Yankees.